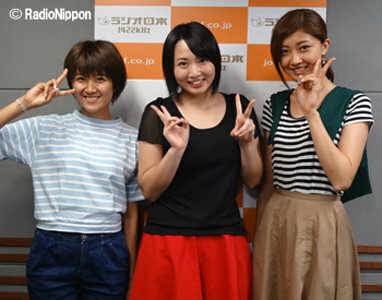 Berryz Station 1422 caster, Tokunaga Chinami, and special commentator, Sudo Maasa, warmly greet the listeners. There is excitement in the air this week: they have a super special guest visiting them! Without further ado, their guest introduces herself as Kumai Yurina, the 21-year-old in charge of good looks within Berryz Koubou! Not long after, she inquires what is going on: it’s usually Chii’s role to be teased by forcibly making her the guest on occasions such as this. Still, even more worrying to her is how Maasa is back on the show so soon since her last visit — she suspects she might be aiming to become a more permanent part of the show. Maasa argues that she’s innocent: this is all decided by the staff. “I’m just trying to do my job,” she says. Chii takes the opportunity to point out why Maasa doesn’t deserve a regular spot on BZS1422: to her and Kumai-san, doing this show doesn’t even feel like work. Maasa laughs at this statement. Kumai-san: … We’re just here to have some fun. Right? Maasa: To “have fun?” This is work! Work, I tell you! Chii asks DJ Yurina to introduce the first song of the show. Tragedy ensues. It’s time for a special corner: the Great BZS1422 Year-End Party! That’s a fancy name for what Kumai-san points out means simply a free-talk corner. Also, pizza. 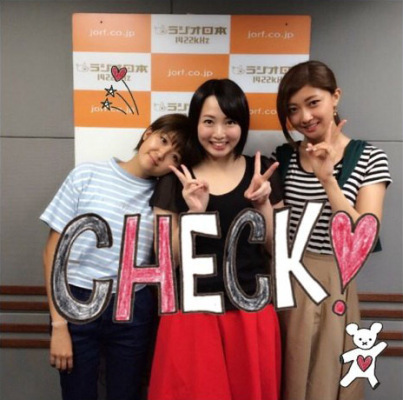 2014 is just about over, and Chii inquires about the no. 1 thing Kumai-san was the most into this year. Kumai-san answers that for her, it’d have to have been Ariel the Little Mermaid: she happened to see Chii watching the movie on DVD one time, and she just found the character of Ariel so irresistibly cute. Ever since then the number of her Ariel goods has been seeing a constant increase in number. For Chii, her no. 1 item of 2014 must’ve been her camera. She was constantly carrying it around this past year, like on Berryz’ bus tours, their trip to Disneyland, and their Paris expedition. But another one of the big things she was into, she claims, was actually her blog: she updated it a lot more often than in 2013. Kumai-san accepts Chii’s answer regarding the camera, but not so much the bit about her blog. Speaking of blogs: just last week, Kumai-san was proud to announce that she’d been posting on hers every single day for more than two weeks. That streak has now ended. Kumai-san: Well, it’s… if I’d kept going, I would’ve only made the fans expect too much of me. Chii: Ah, yes. That’s no good. You shouldn’t let them have unnecessarily high expectations. Kumai-san: Yes. So I had to end it at some point and go back to my old self! Kumai-san: So I haven’t been blogging. And what’s more is, I have no plans to blog today either! Chii asks Kumai-san if there’s anything she has yet to do this summer. Kumai-san says she hasn’t gotten around to going to the beach even though she says she’d like to — she recently even bought a swimsuit. Chii wisely asks for further details regarding this newly acquired swimwear, but after a brief silence, Kumai-san says she’s going to leave it to the listeners’ imaginations. She does say, though, that she’d feel embarrassed wearing just the bikini so she also bought a pair of shorts and a sweatshirt to wear over it. Chii still presses for more details and at least asks Kumai-san what color her new bikini is, and after some hesitation, Kumai-san says it’s a blue-ish color. Chii says the thing she hasn’t done this summer is wear a yukata. In fact, she doesn’t even own one. Chii just recently heard about something called the Nouryousen (a cruise around Tokyo Bay that gives discounts to people wearing a yukata) and she says she’d like to partake in that. The only problem is, the summer festivals for the year are all nearly done with so there won’t be many more opportunities to wear a yukata anymore. Thus, especially with the changing trends of yukata dresses, Chii thinks she’s going to give it a pass this year and buy one early next summer instead. The two introduce their special guest of the week: Sudo Maasa! Chii asks her how she’s doing lately, and Maasa replies she desperately wants to see Kumai-san wearing her new bikini. Chii and Maasa get into a heated discussion about Kumai-san’s bikini despite her protests. Chii: It’s apparently a blue-ish color! Chii: So that’s either light blue, dark blue or navy. I bet it’s navy! Maasa: Navy seems like it’d really suit her. Maasa says she also wants Kumai-san to wear a bikini that’s similar to her own blue member color. Kumai-san promises that if she ever does, she’ll take a picture and send it to her. Maasa says she’ll make it her phone’s wallpaper. Chii is disgusted. Chii asks if Maasa did anything summer-like this year and Maasa says this was the first summer she got to go driving since she just recently got her driver’s license. Chii points out that driving isn’t particularly summer-like at all, and adds that she’d be deathly afraid of getting in a car driven by Maasa. Kumai-san says Maasa does indeed seem like she’d speed a lot, but Maasa denies this and says she drives safely.